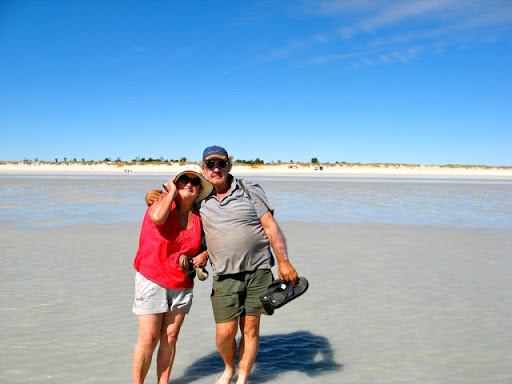 This blog section covers the West Australian desert tracks we travelled in 3 weeks accompanied by Dave and Pauline, Oka 137. 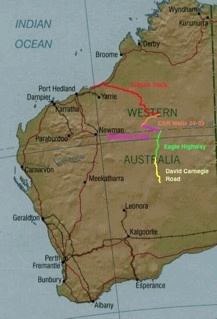 It includes the David Carnegie Road, the Eagle Highway, the Talawana Track, the centre section of the CSR from Well 24 to Well 33 and the Kidson Track out to 80 Mile beach. 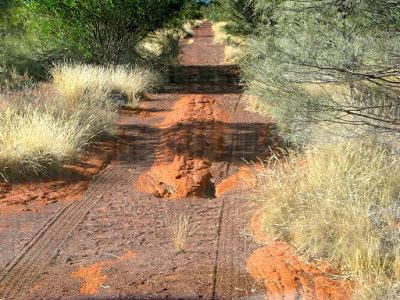 The total distance of these desert tracks is more than 2000 km, most of which should not be attempted alone, ill-prepared or inexperienced. The only fuel supply between Tjukayirla Roadhouse on the Great Central Road and the North West Coastal Highway is at Kunawaritji at Well 33 on the CSR. While the tracks were dry when we travelled them, after bad wet seasons they can become very boggy, washed away or impassable, and some are so narrow and overgrown as to be barely visible. 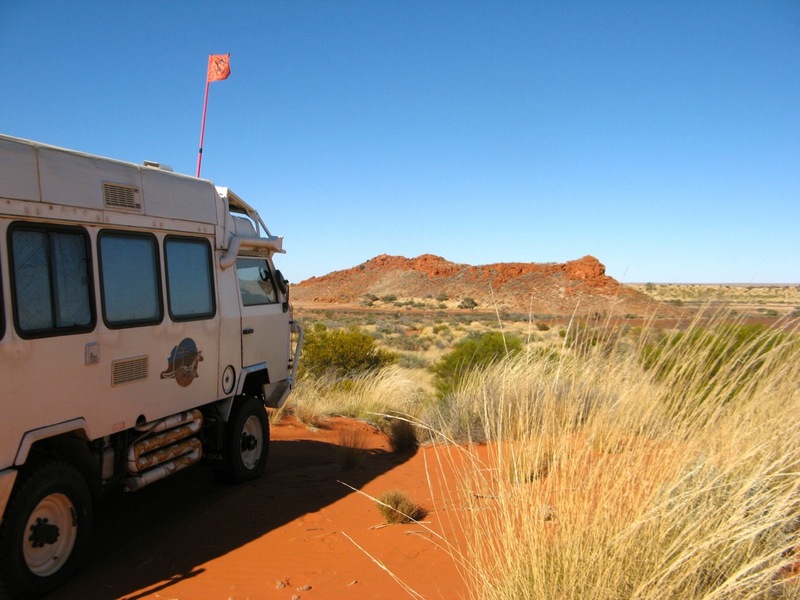 The surfaces varied from very soft sand and sand dunes, to rocky with deep wash-aways and corrugations. 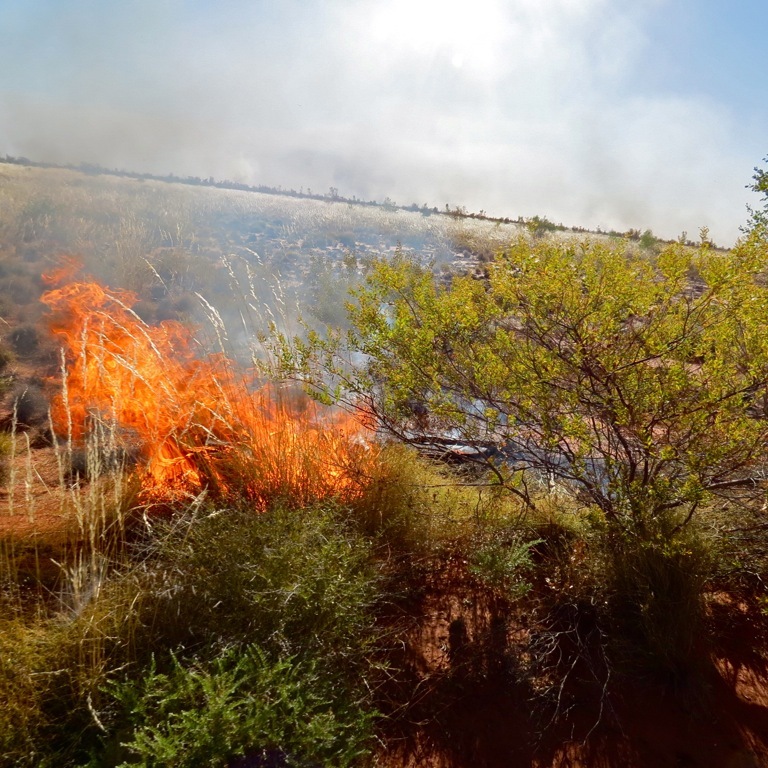 In dry conditions fire is always a risk so ensure all flammable material is cleared from your vehicle daily, and never park a hot vehicle on dry grass or spinifex (which can be 2 m high on the track). Many vehicles have been lost to fire in these areas. These tracks are all very remote from any habitation or assistance so carry detailed navigation systems, adequate provisions, emergency communications equipment and a full set of recovery gear. Refer to other entries on safety gear and recovery equipment. Saw a herd of camels wandering on and off the road. 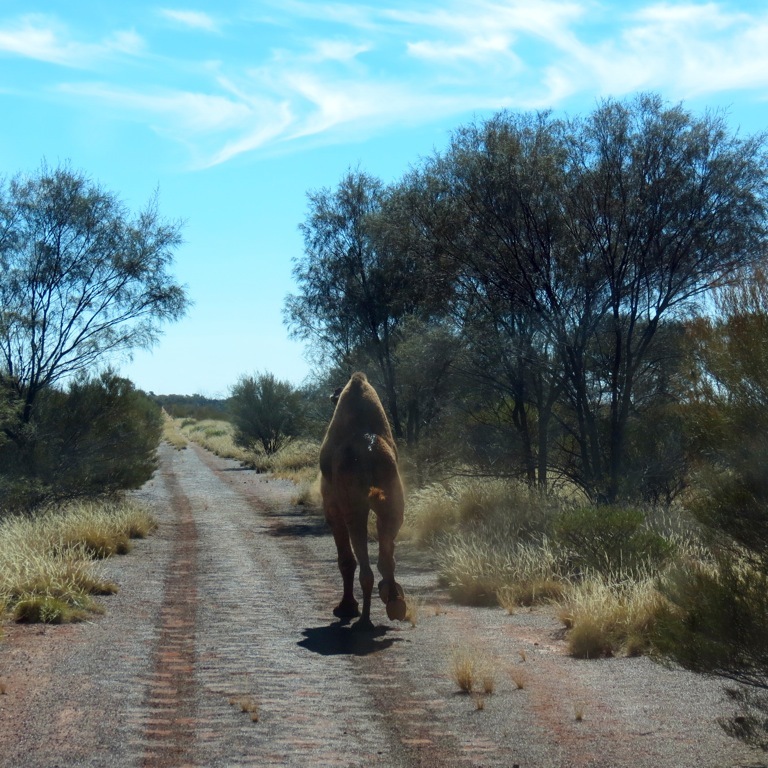 Camels are an ever present danger as they are heavy beasts and persist in using the tracks as walkways. Hitting a kangaroo may damage the front of your vehicle, but hitting a camel would destroy it. Called D and P on the HF Radio at midday to ensure we coordinated out meeting this afternoon, they were about 20 mins ahead of us. We were warmly met by D and P at the roadhouse after 18months of emails and 12 months of planning and they'ed even planned a shower for our arrival but we beat them to it. We explained that our mothers warned us about people we had met on the internet, they may be axe murderers. Little did we know that Dave had a big axe, chainsaw (and more) with him but we were obviously worth more to them alive than dead. 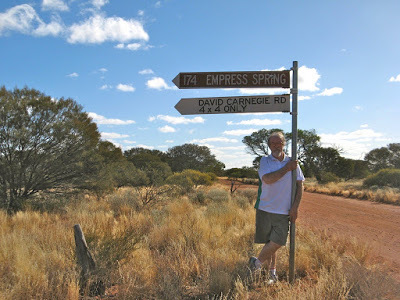 We fuelled up and headed up the David Carneigie Road, a much smoother track than expected (we were being fooled of course) to Empress Spring, an aboriginal water hole down a deep cavern. Darkness beat us to the spring so we camped in a clearing for our first campfire and cool evening of chatter and wine, or maybe the other way around. We found Empress Spring, its plaque and visitors book. The only way down was via a steel chain ladder and none of us found the necessity to test its strength. I noted our chicken-ness in the visitors book. 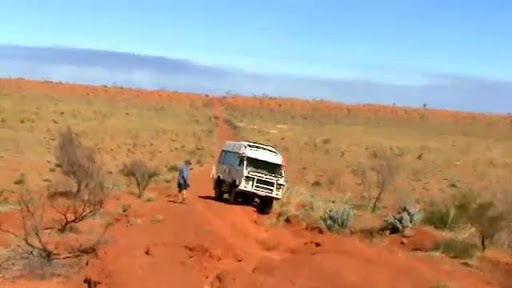 This very remote country out here and one slip could spell disaster. 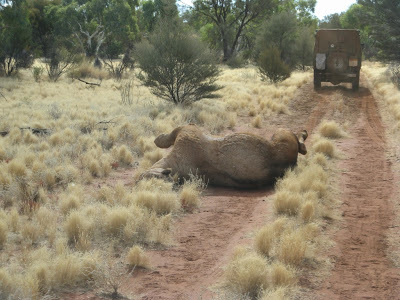 Camel shooters had obviously been that way recently and left the remains of the beasts on the side of the road, we had to divert off the track to avoid them. We had wondered for some time how it was that camels always managed to die on the side of the track. After the Well, the track became, as expected, a narrow 2 lane track but quite navigable, except for more mobile road blocks who will not get off the track, and why not? it's a smooth direct route, unlike the prickly spinifex desert. As we went further north into the Gibson Desert we met a plethora of wash-aways to contend with. We stopped at all the major ones and planned route for the wheels to take to minimise the changes of a rollover or getting seriously stuck. It was slow work but it worked fine so the videos look a lot smoother than the original path would have done. 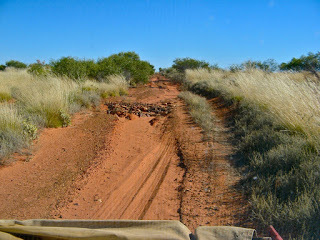 For some we had to divert off the track and create our own path around them through the surrounding scrub and spinifex. 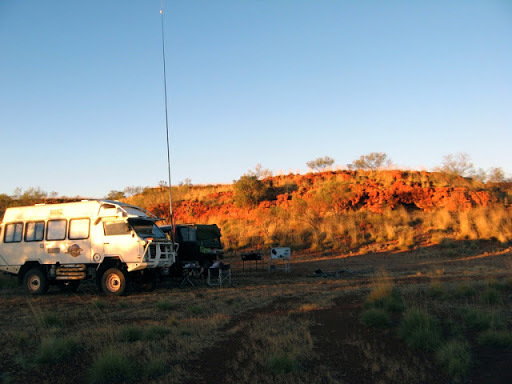 We met the Gunbarrel Highway later that day at Mangkili Claypan Reserve and started up the Eagle Highway directly opposite the end of the DCR. A few km up this track we came across a sandalwood cutters camp where very friendly team of Fijian workers were busily cutting and pressure cleaning a huge stockpile of sandalwood for the aromatic and wooden ornaments trade. Since sandalwood is an Indian tree, we assume that there is an indigenous sandalwood variety with the same characteristics. They all stopped work and introduced themselves and offered anything we needed from their well stocked supply cabinets. 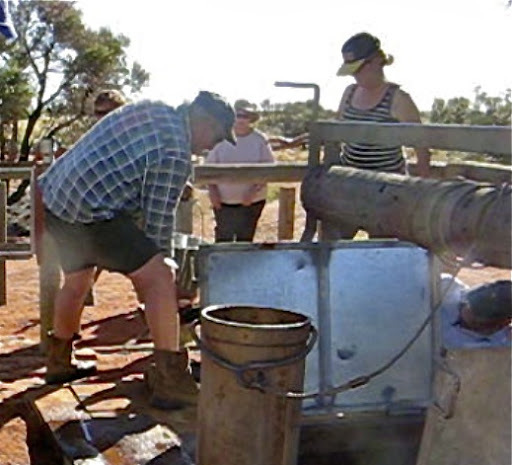 We only needed some water which they provided from a bore with an ancient and only partial reliable petrol pump though about 200m of leaky pipes. And very sweet water it was too. 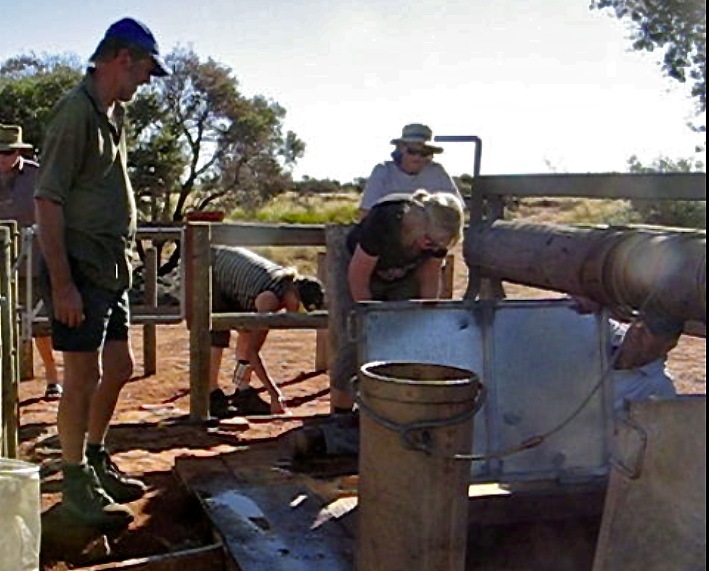 We camped soon after at a clearing near a windmill and tank where Dave tried out his vertical inertia pump on the borehole. It consisted of a plastic pipe with a valve at the bottom and weights inside. When jiggled up and down in the water at the end of a long length of rope water was drawn into the pipe and when full (ie heavy) it was pulled up and the pipe emptied into a container. In the early days a camel it would have done the drawing up but I''m not sure about the jiggling process though. After dinner we cracked open a bottle of Port to celebrate the start of our adventures. Can't recall much else then until the next morning. We had some problems with an errant shower tent this morning and eventually had resort to reading the instructions. This didn't help much so muscle power provided the solution. 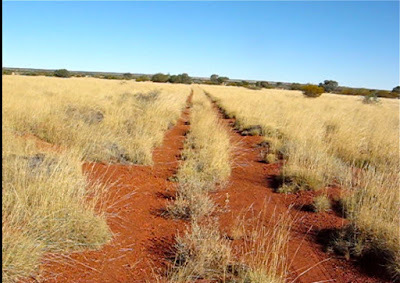 The Eagle Highway started off fairly clear but soon became badly washed away and as we progressed slowly north the track became more and more overgrown and eventually disappeared almost entirely in a sea of spinifex. Doing some gardening to form a route out of the ruts. MVI 8382 from David and Janet on Vimeo. 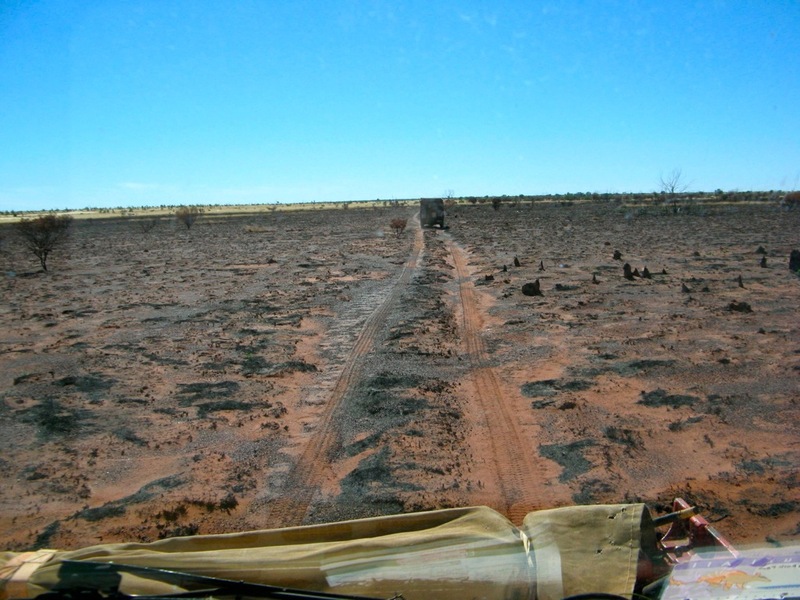 Several times we had to divert around deep gullies (one of which we got stuck in up to the differential) and it was very difficult to find the original wheel tracks once off the track. 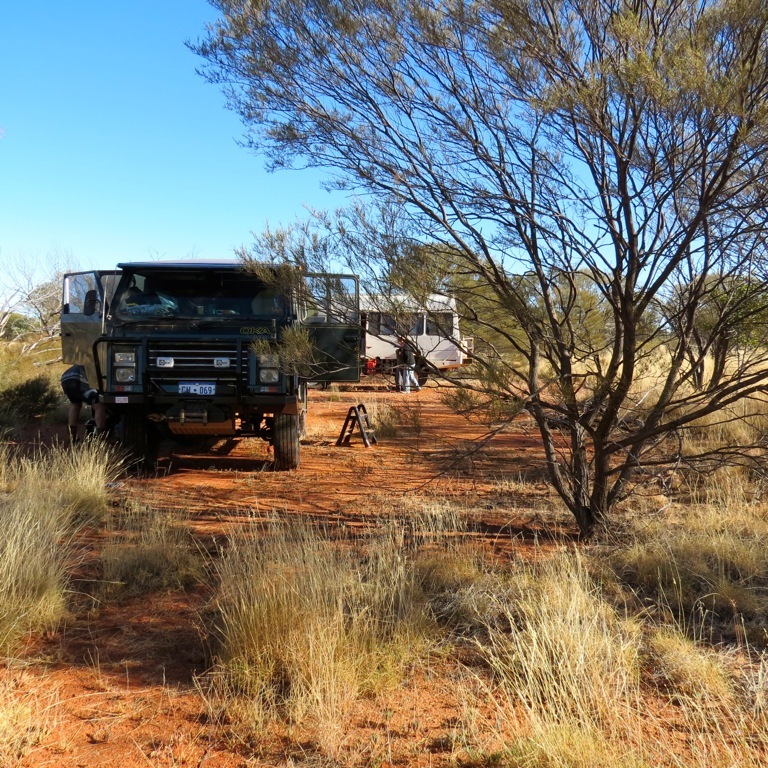 We didn't know it at the time but yesterday's friendly sandalwood cutter folks were the only people we would meet in 8 days of desert travelling from the GCR to the CSR. 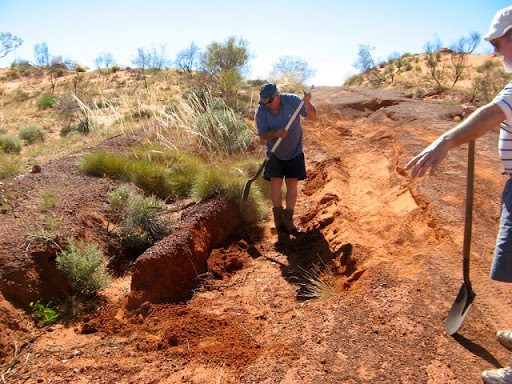 ...but for this sort of challenge you may have to divert a long way from the track around trees and over spinifex which might hide dangers that you can't see, like gullies and tree roots. 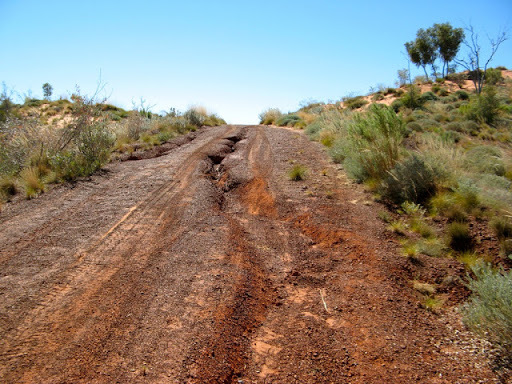 We could not have followed the Eagle Highway route without our moving map system, and travelling alone or in a smaller 4WD, or in wet conditions, would have been extremely risky due to to restricted track visibility and deep washouts. Even our Oka's with their high ground clearance and excellent visibility were barely adequate at times. Sometimes it was easier to follow. We tried in vain to reach Warri Camp this evening, a location where the last nomadic Aboriginal family had been located in 1977. 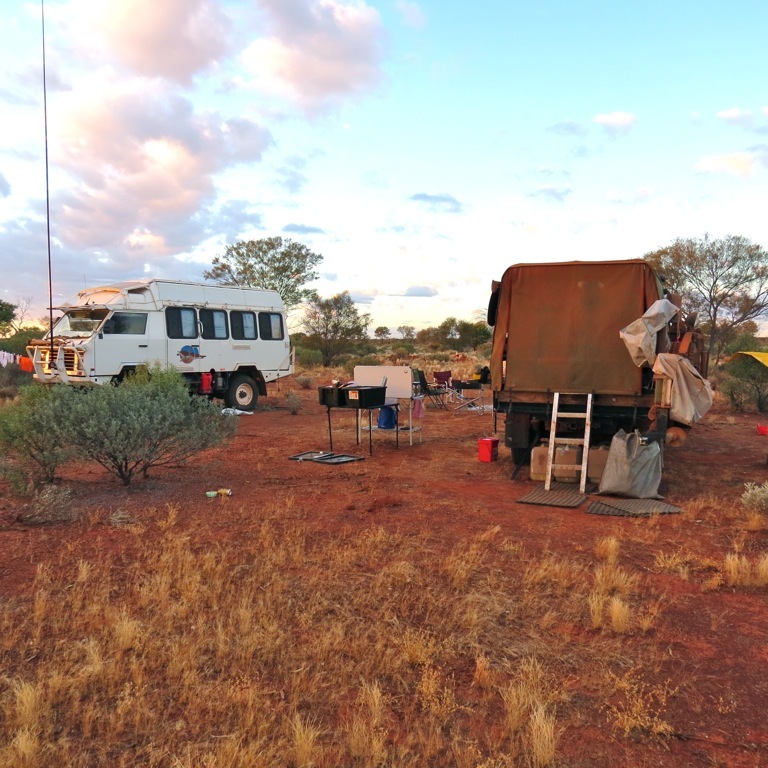 Due to difficult track conditions and the setting sun on our dirty windscreens we camped for the night in a clearing and found the camp the next morning. Warri Camp is a a very remote location exactly centred between the Gibson and Little Sandy Deserts and south of the Great Sandy Desert. There's nothing much there now but it's easy to see how the indigenous people could have lived there undetected for so long. 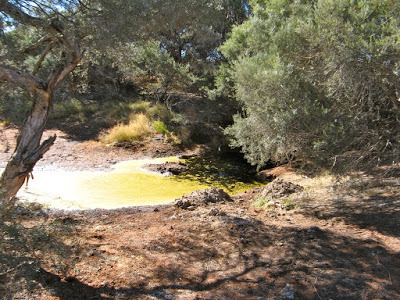 There were some rock outcrops where water holes would have been found and plenty of bushland for hunting. 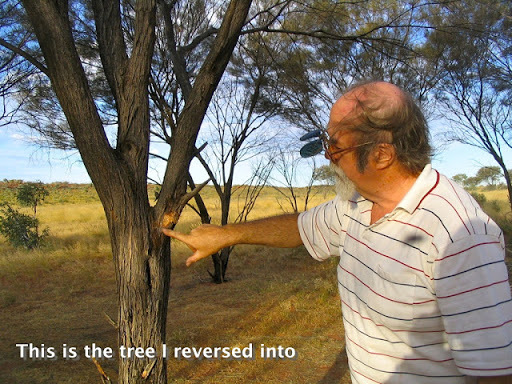 In 1977, a Martu couple – Warri and Yatungka – were escorted in from the desert amidst the worst drought to hit the region in the twentieth century. Their story dates back to the 1930s when the couple eloped from their community, living as exiles in the desert. Theirs was a love-match that was not permitted under Western Desert Aboriginal law, which prescribed strict rules regarding marriage and harsh penalties for those who would defy these laws. Nothing much at the Warri Camp now. 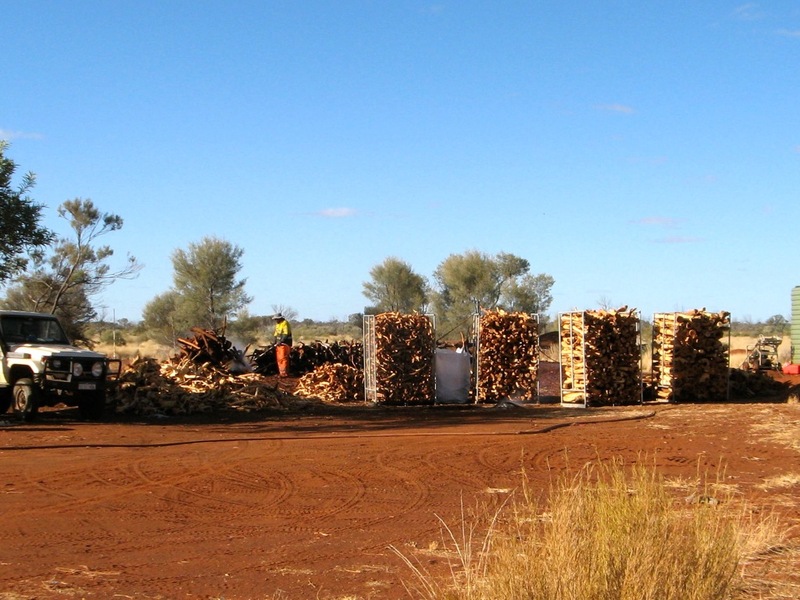 The site has been used for subsequent construction activity as a truck loading bay had been built. 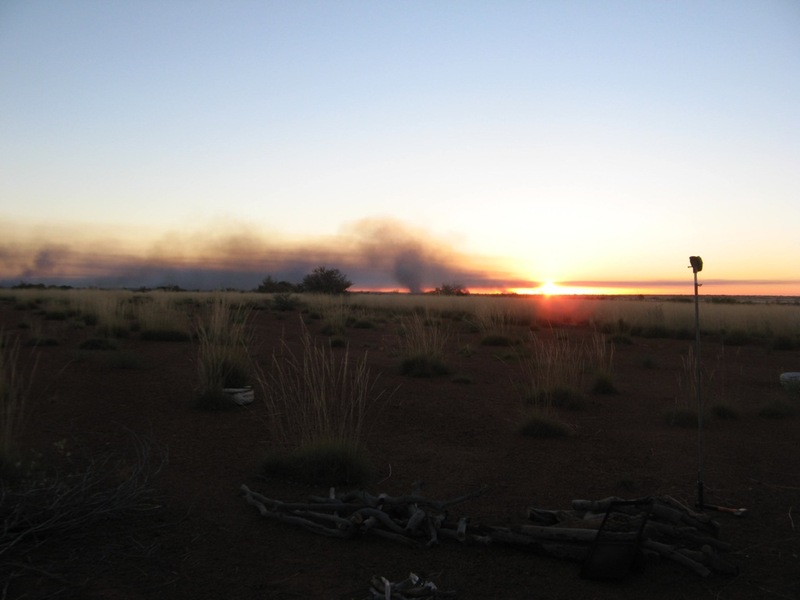 After forty years in the desert together, Warri and Yatungka died shortly after returning to civilization, as did the master bushman Mudjon, their chief rescuer. 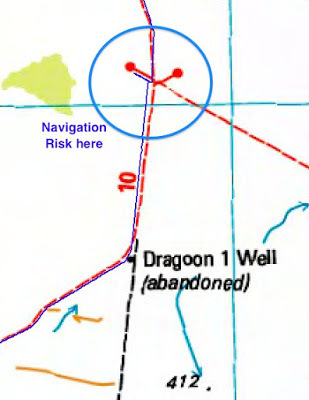 About 4km north of the Dragon #1 Well, the track meets a cut line (also called the Eagle Highway on maps) which leads south east to/from the Gary Highway. 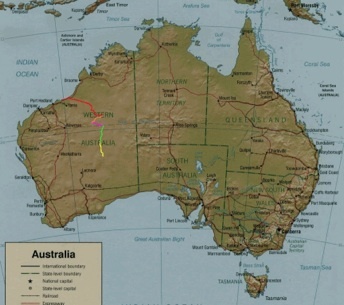 The north west continuation of that track goes nowhere. The Eagle Highway section we wanted heading north is supposed to be directly opposite the track we had come up from but was nowhere to be seen, even though it's shown as such on the most detailed maps we had (NatMap 2008 1:250,000 topographic digital raster maps). 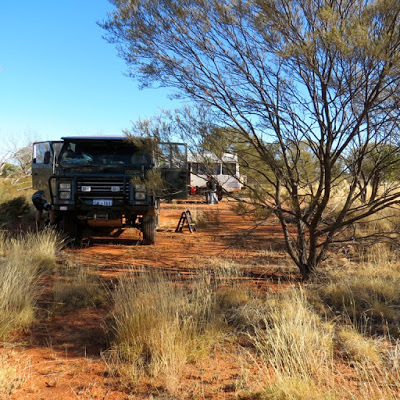 We tried the north west track for a few km without success and eventually located the actual junction of the track about 1/2 km south east at 24º 02.361' S 124º 33.322' E. It took us 1/2 an hour to locate the 2 thin wheel tracks heading north. 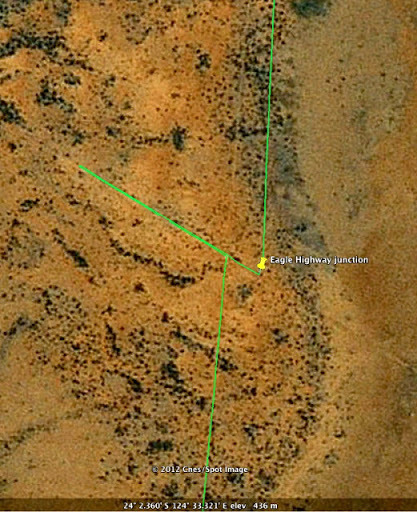 On Google Earth the original track due north can be clearly seen, but at ground level it has disappeared completely near the junction and an alternative track has been formed, presumably to bypass some track difficulties. Several times along this track we had to stop and take stock and determine the safest route though. Often this meant deviating off the track to form our own side tracks through the spinifex and around impassable obstacles. 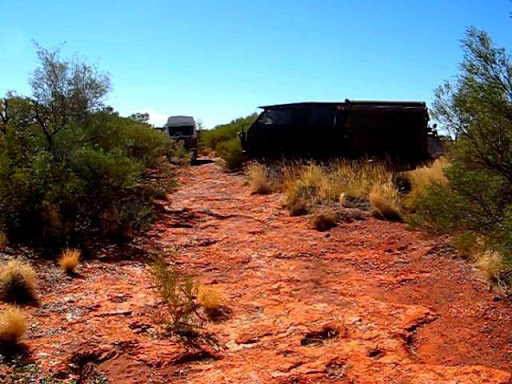 Here's a video of a diversion around a particularly difficult section. It meant negotiating a dry creek bed with a steep entry point. ...and this is Dave returning the the track. Some creatures are quite happy living in this area. 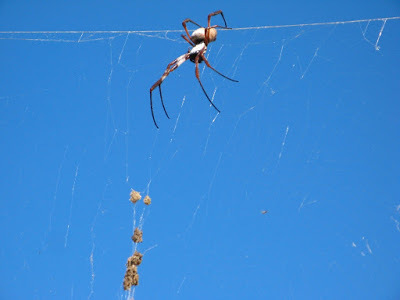 This web was as strong as fishing line and could easily support small branches. 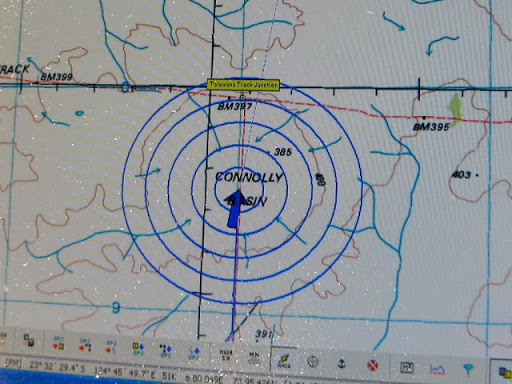 We passed through the Connolly Basin to the the Talawana Track junction. 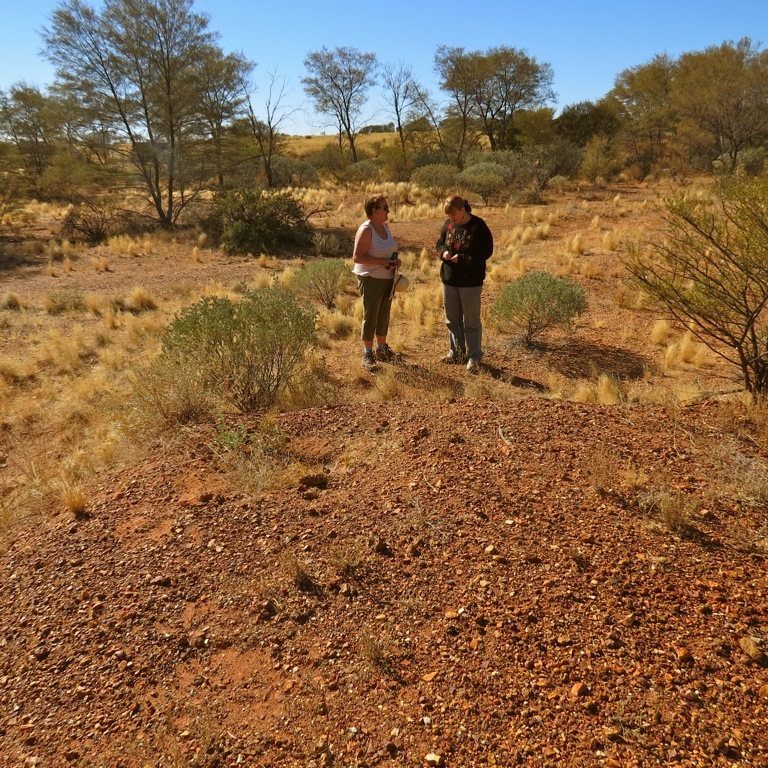 The Connolly Basin is an ancient meteorite impact crater, barely discernible at ground level as it's 9km across and only 25-30 m high at the rim. It's situated near the Talawana track at the top end of the Eagle Highway and was first determined as an impact crater by Eugene Shoemaker (a friend of Len Beadell) in 1985. It was Beadell's track construction that allowed the Shoemakers to explore this region of Australia. 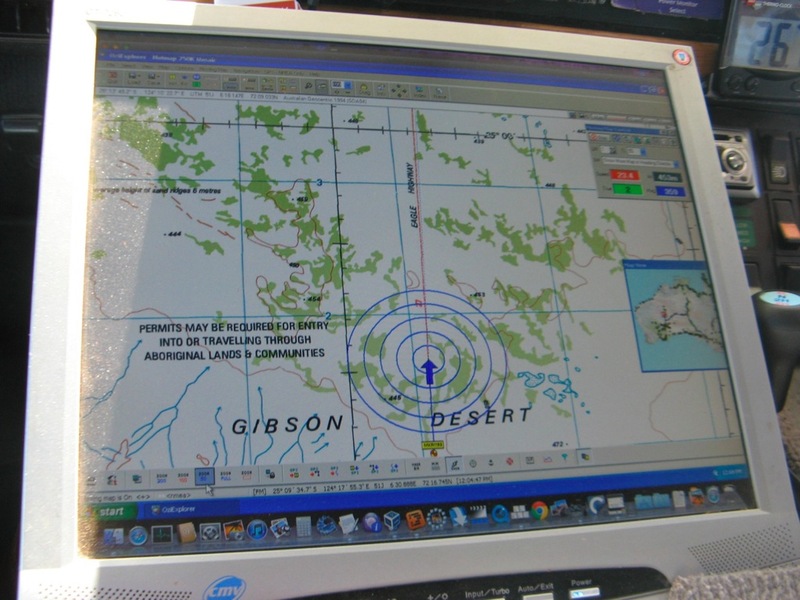 [They also confirmed the nearby Veevers Crater (off the Gary Highway) as an impact crater in 1974]. 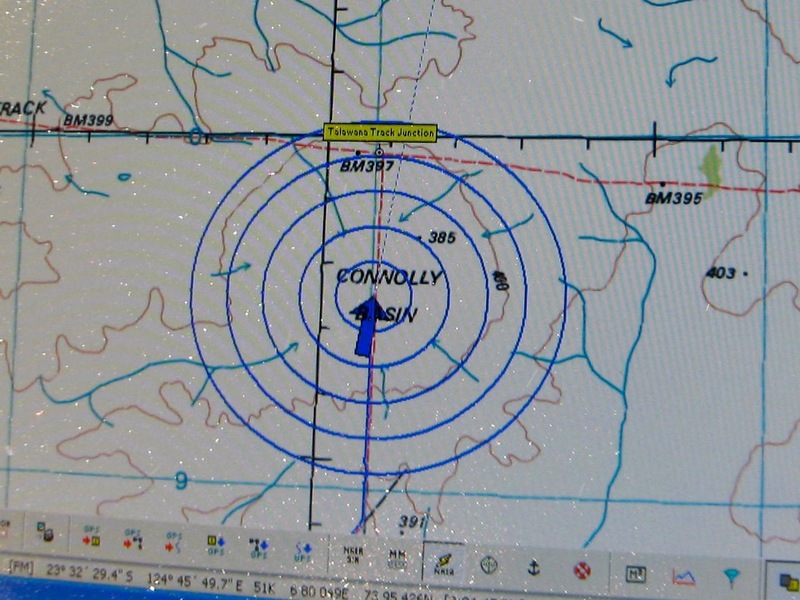 On the map, the Connolly crater can be imagined from the series of dry gullies that drain into its centre from the surrounding countryside and from the almost circular contour line around it. 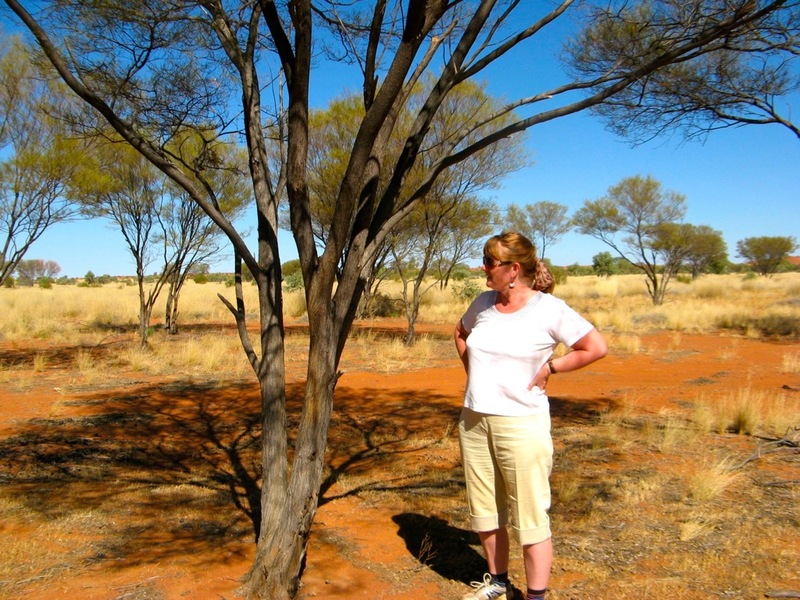 The Connolly Meteorite ground zero point is marked by a cairn of stones and an old pole, but you wouldn't want to be standing there, 57 million years ago. Looking back down the Eagle Highway. Doesn't look so bad does it? 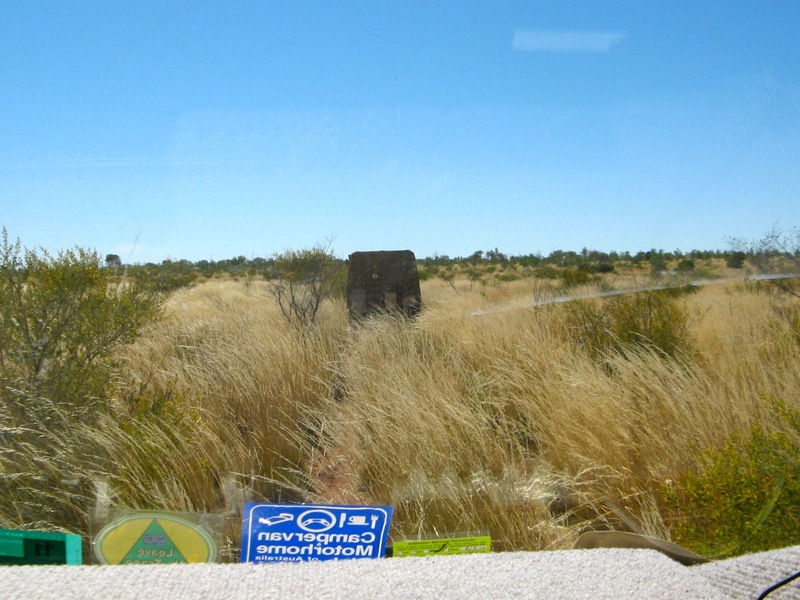 At the Talawana Track junction there is a glass jar packed with notes from previous travellers. We also put a cautionary note in the jar about the conditions on the Eagle Highway but J post-dated the note as 17 Sept instead of June, to avoid any litigation issues. I expect rude emails to start appearing soon. 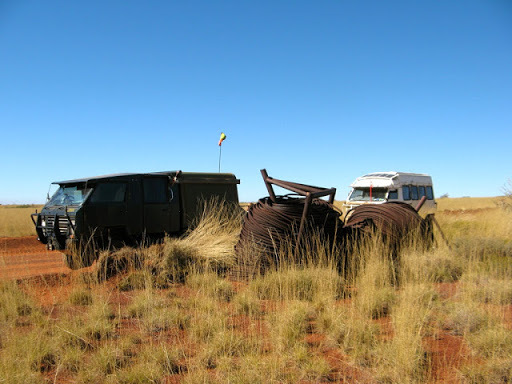 We passed by the remains of an old LandRover, the same model as we traveled around the world in, but in a slightly worse state of repair. The Talawana Track is a typical Len Beadell track, straight, between sand dunes, and corrugated. We made a nice desert campsite alongside the track. At last it was starting to warm up a bit. We searched out and found Midway Well, long since abandoned and overgrown. It was certainly an important water source to Aboriginal inhabitants and would have been a lifesaver to desert explorers. We also located a more modern well which had been fitted with a hand pump and trough. 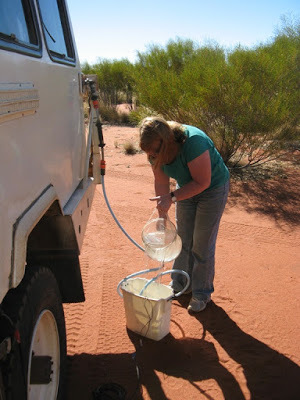 The water was so good and close to the surface that we decided that a lay-day was in order so we could do some maintenance before attacking the CSR and the ladies could do their (our) washing. 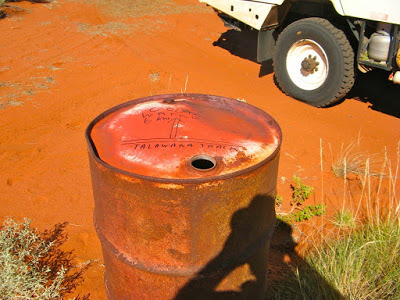 On the way out of the well site, we stopped to mark an old oil drum with the directions to the water for other travellers and continued down the Talawana Track. This was another example of never, ever passing by an oil drum, star picket or other signs of human habitation without exploring them. They are never put or left there without a good reason. We passed by the wreck of an old trailer that only needed some wheels, a dab of paint and a total mechanical rebuild to be as good as new. Today we completed the Talawana Track and reached the junction with the CSR just short of Well 25. 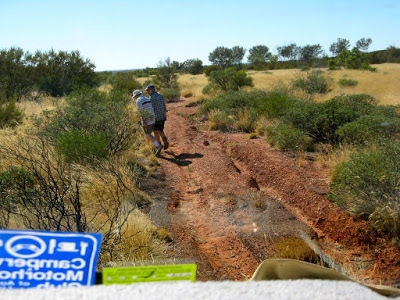 We left messages on the sign and were surprised to see a sign saying the track we had just come down was now on Martu Native Title land and access is completely prohibited but there was no sign at the other end. 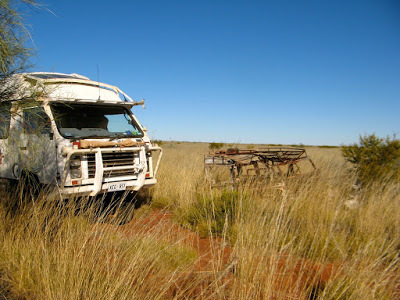 We are getting disgusted that chick-livered governments and just handing over vast tracts of Australia to people who don't need, and will never make use of the land. 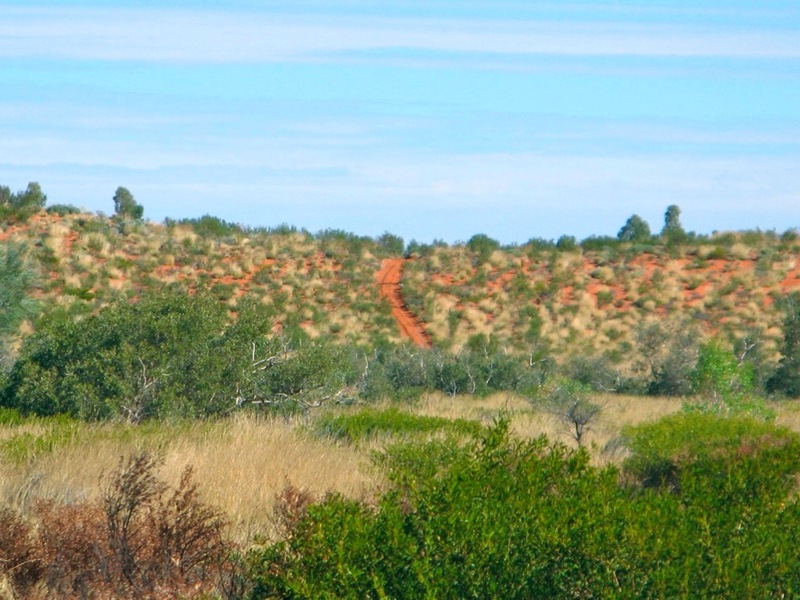 And in any case Rights Of Way should have been excised from the Native Title claims so access can always be made to these remote parts of the country. 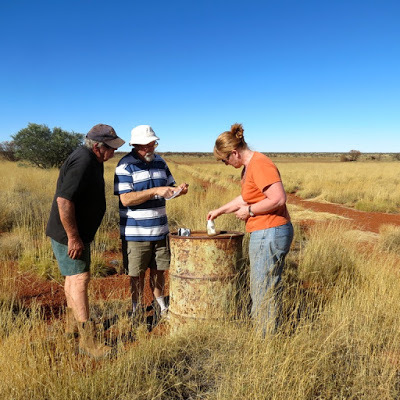 If it hadn't been for the endeavours of pioneers such as Len Beadell, this land would never have been made accessible to the people who now "own" it. 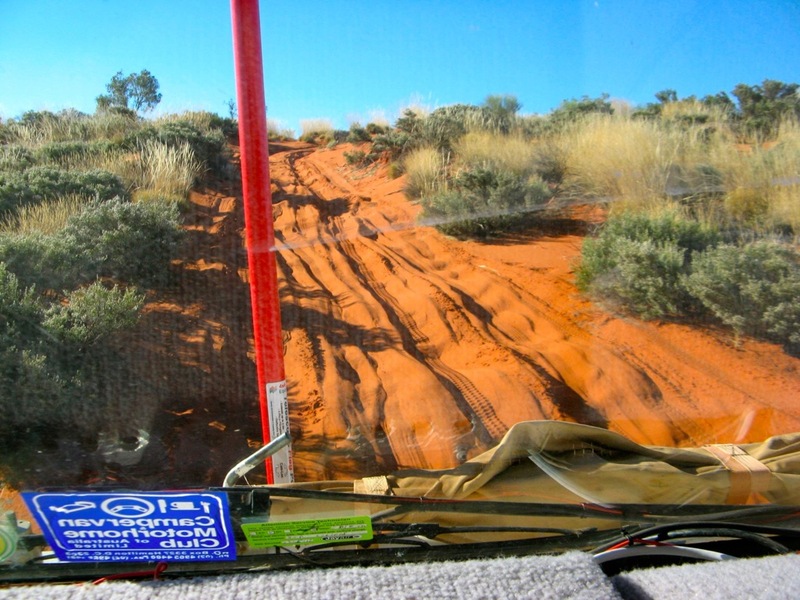 Once on the CSR (most of which fortunately is still a Public Access track), we were met immediately by a huge sand dune which caused us a few problems (videos to follow). Previous gung-ho drivers with smaller 4WD's and camper trailers had obviously decimated the lead-ups to the dunes, spinning their wheels and leaving large uneven hollows we had to bounce up though, threatening the suspensions of our 6 tonne vehicles. 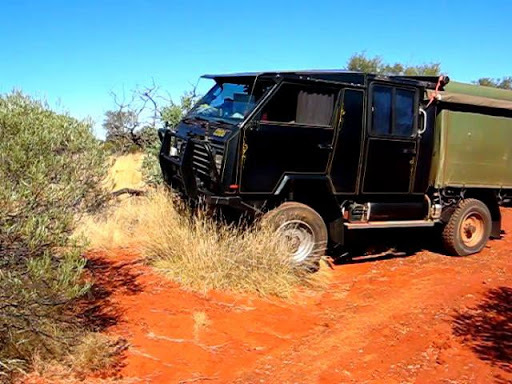 Being the first large dune we had come across on this trip, we had to adjust the tyre pressures, speed and gearing to get over it successfully. Ironically, we had both done this section of the CSR before and don't recall this dune being a problem, an indication that overuse is adversely affecting track conditions. This a very high and steep sand dune, with soft sand all the way and deep hollows to bounce in and out of. 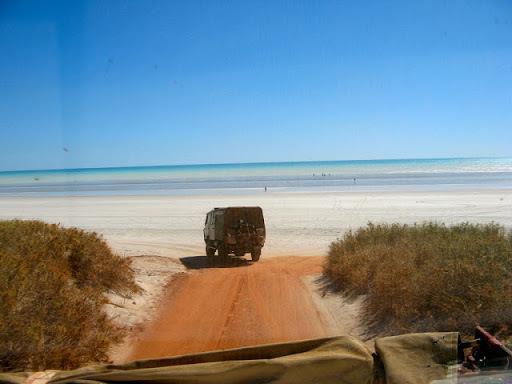 But we overcame that dune and many others that day and met our first other travellers in 8 days. It had been a pretty lonely but satisfying journey since leaving the GCR 8 days previously. Further up the CSR is Well 25 where I relocated a tree that I first reversed into in 2007. It's wounds have healed up but my memories haven't. I wanted to visit Well 25 since I had an altercation with a small tree there in 2007 and wanted to relocate it to see how it was doing. I had reversed into it on our first drive down this part of the CSR in 2007 and broken the rear gate. We had to stay the night there to fix up the damage. We relocated the same tree and found it had recovered far more easily than my memories had, and there was no scaring left on it. Well 26 has been completely restored in the last 2 years and was buzzing with people. 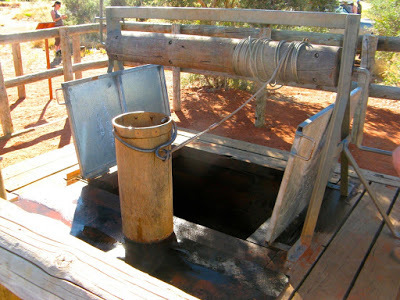 D accidentally kneecapped a fellow tourist with the handle of the well bucket handle. We lowered and raised the very heavy bucket using the windlass several times collecting water but one other traveller misread how heavy the bucket was and the handle got away from him and hit his leg just below the knee, laying him out cold. ...and then receiving attention from a nurse. He seems perkier somehow, must have been Dave's cold water. Fortunately his leg didn't appear broken, just very severely bruised and we administered what first aid we could in these circumstances (cold water and ice packs and told him to keep up his fluid intake) but it was still 15 minutes before he could get up and hobble away. There were a couple of nurses in his party so hopefully he would recover OK but driving and walking would have been a painful exercise for a few days. We made camp at the foot of the Slate Range of hills. Later I fell into deep do-do for successfully burning J's favourite piece of pork fillet on the campfire and she was sorely not amused. Fortunately it tasted superb and I was eventually forgiven. Today was our only cloudy day of the trip and it was bitterly cold and windy as well. We explored the Slate Range, Well's 27 and 28, both of which are in ruins, and made an early camp with a roaring campfire. We engineered a warm throne seat that we took turns in occupying. At least the receding clouds made for some stunning sunset photos. 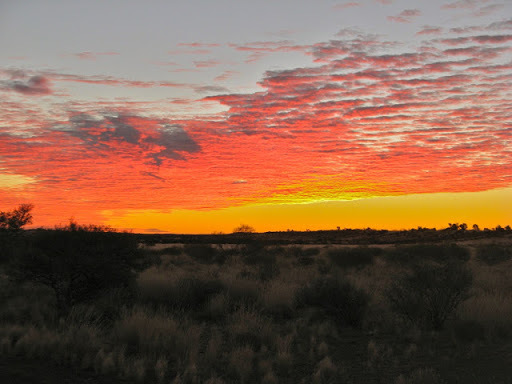 The toughness of the track was contrasted by the beauty of the desert sunsets. Today we explored Thring Rock. We have no idea what a "Thring" is and how you use it but it was very cold wandering around it's fringes. Sand dunes are getting a little easier as move north but the triple headers still demand some respect. We also explored Well's 29 and 30 and made camp at Well 31. 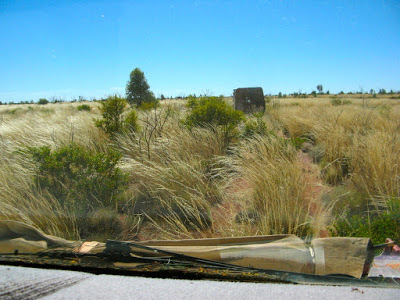 After a few last large sand dunes (which caused one of our party a few problems, but not me), we made Well 32 for lunch and then headed over the well known very corrugated section of track towards Well 33 and our final destination on the CSR for this trip. 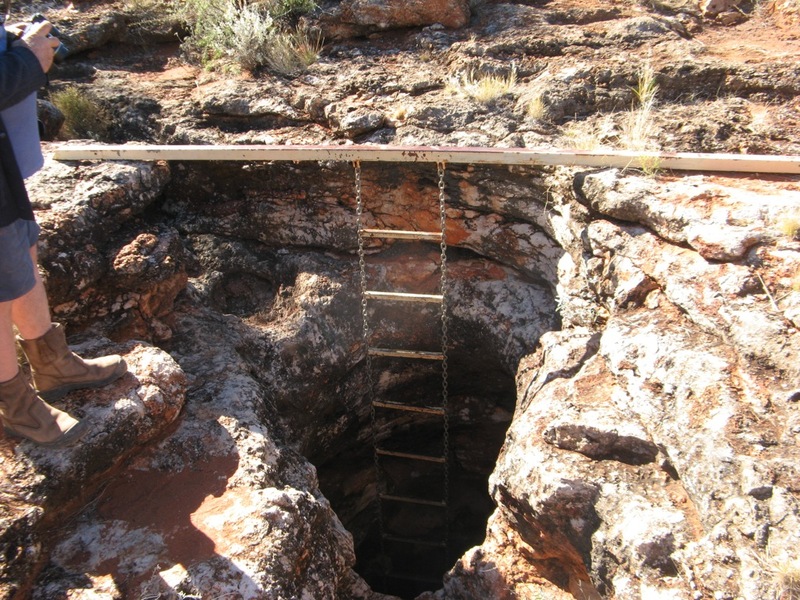 Well 33 had been restored by the Kunawaritji community and has beautiful water. There is even a small lake with birds and green grass surrounding it. 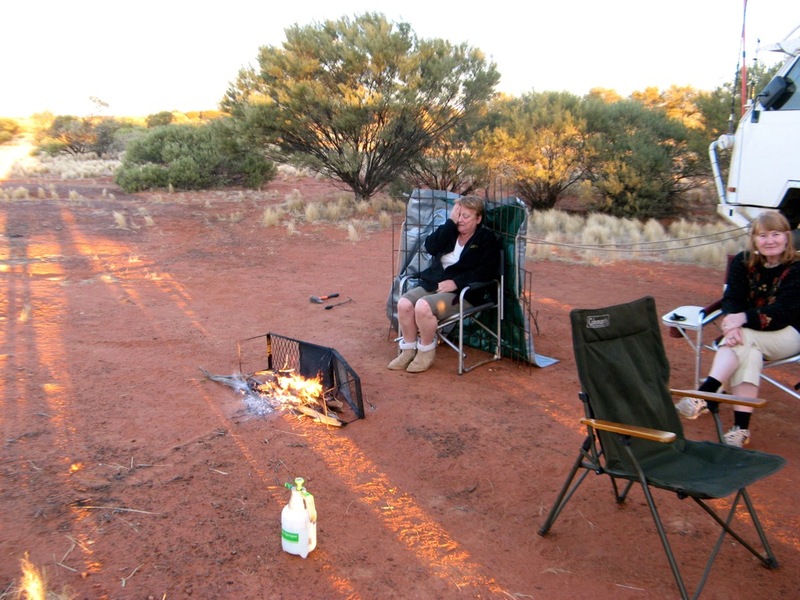 We camped at the nearby campground and copious amounts of washing were done. This was an enforced lay-day since the community is not open on Sundays and we need some fuel to get us to 80 Mile Beach up the Kidson Track. 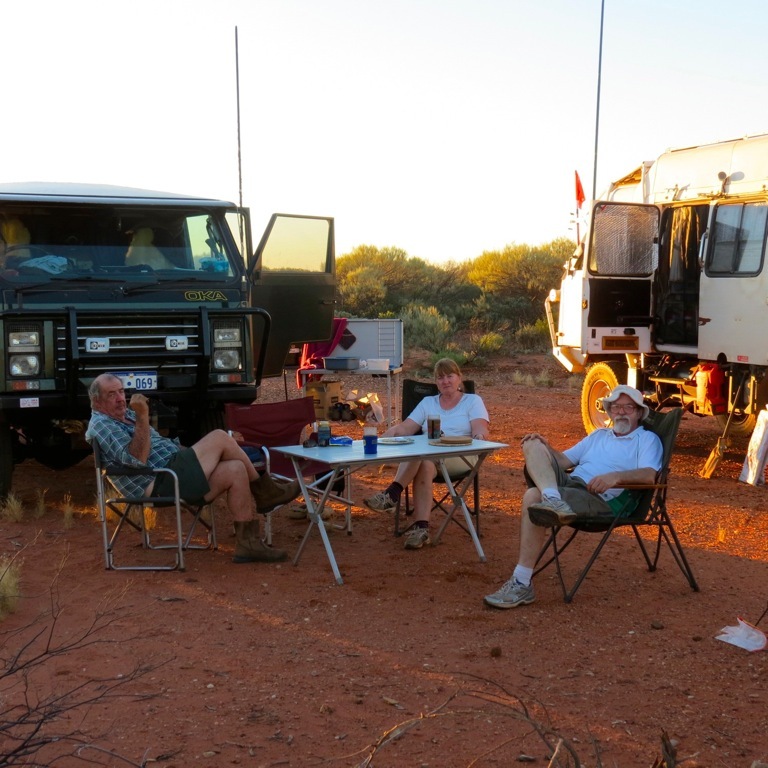 So we did some more washing, a bit of maintenance and a lot of lazing around until it was Happy Hour time again. 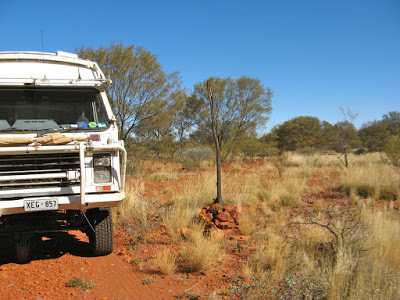 We fuelled up at the Kunawaritji Community (at $3.40/litre, served by Maurice, a very engaging Aboriginal worker), bought a few supplies at their much improved store and headed down the Kidson Track. 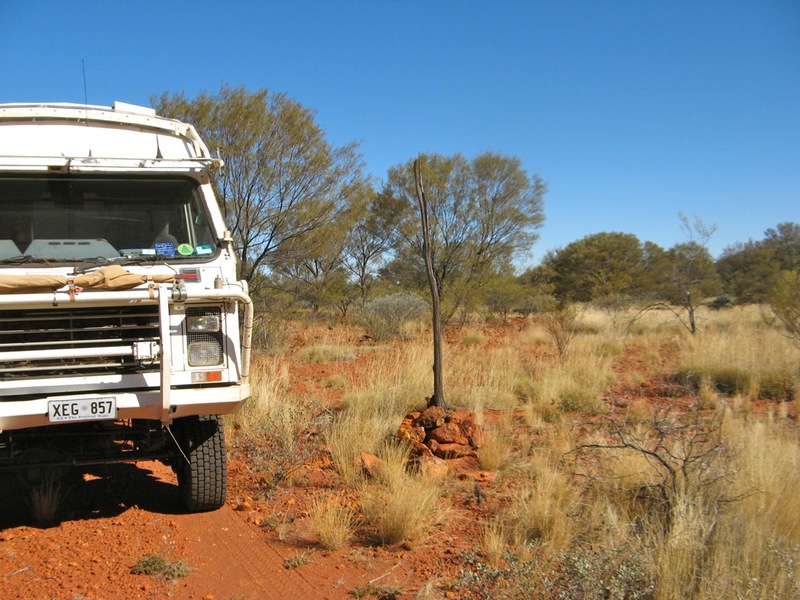 The first 100 km or so are in very good condition since it forms the now main (gravel) route from Alice Springs westwards to Marble Bar and Port Hedland. At the junction on Lake Auld, the real Kidson Track branches off north and immediately becomes a 2 lane desert track again. 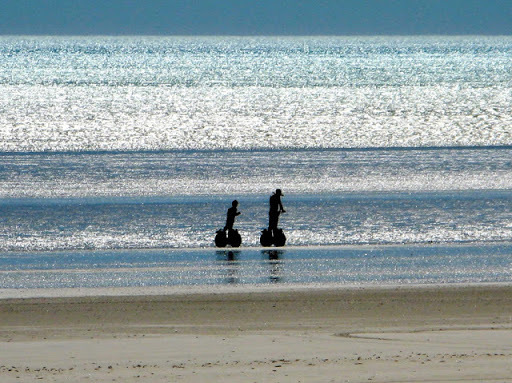 J complained about the need for so much skin moisturising cream and claimed that it was because "the water was so dry". Didn't quite make Razor Blade Bore so we camped in an old gravel scrape, not flash but better than spinifex. 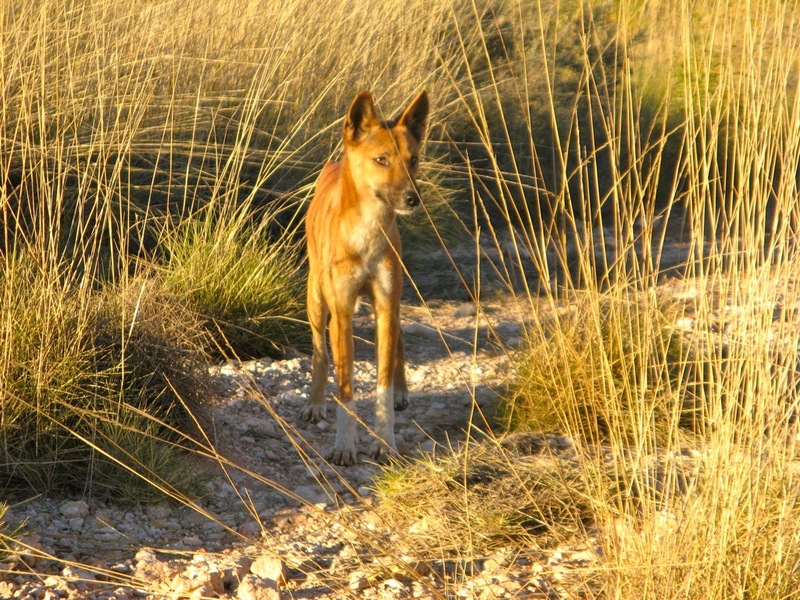 A dingo came to visit us at breakfast time. There were no babies here so after inspecting our domestic arrangements he moved on. Met a team at Razor Blade Bore doing "cultural survey" for a mining operation in the area. This involved driving and flying a group of indigenous people around in a helicopter (at our expense) identifying sites of significance. Obviously they were easier to find if everything was burned to the ground. While in the air the helo pilot dropped phosphor bombs to burn the vegetation. 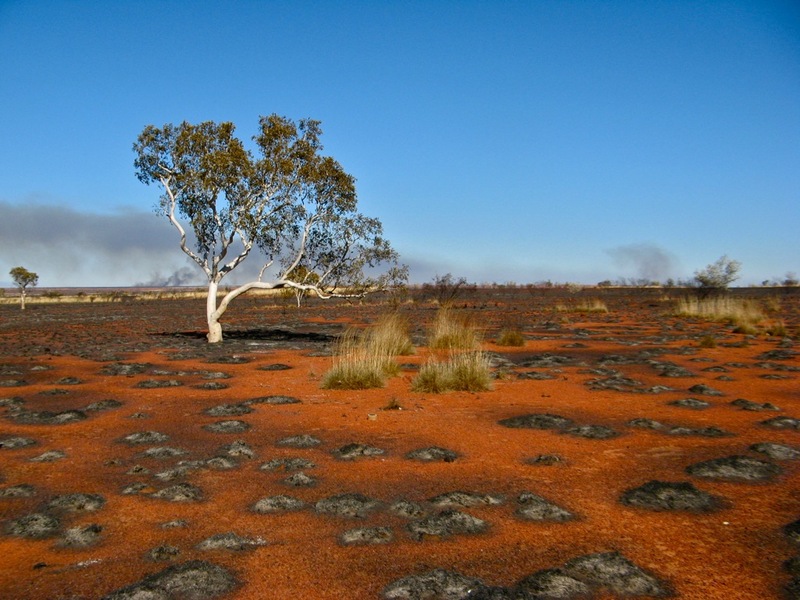 The result was a landscape which resembled the Kuwait oilfields after the Iraqi tourists left in 1991, and some of the fires were dangerous close to the track. In this remote location, we could see no reason to burn the vegetation except for long established cultural reasons which are now completely irelevant. 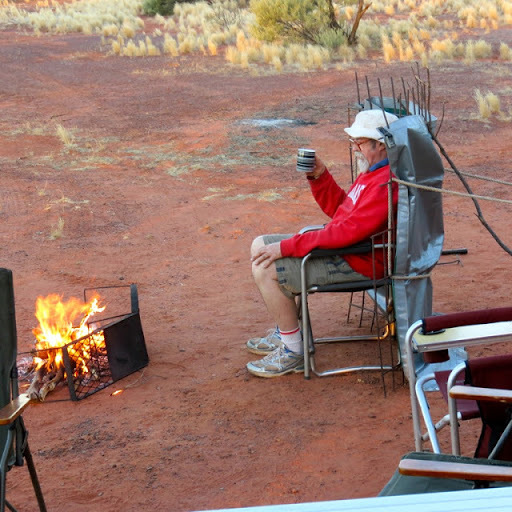 The local indigenous people now do their hunting and gathering in exactly the same places that we do, Woolies and Coles. 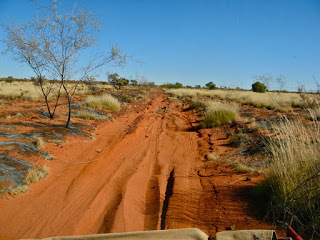 Had the usual difficulties with wash-aways and had to build several side tracks to get around them. 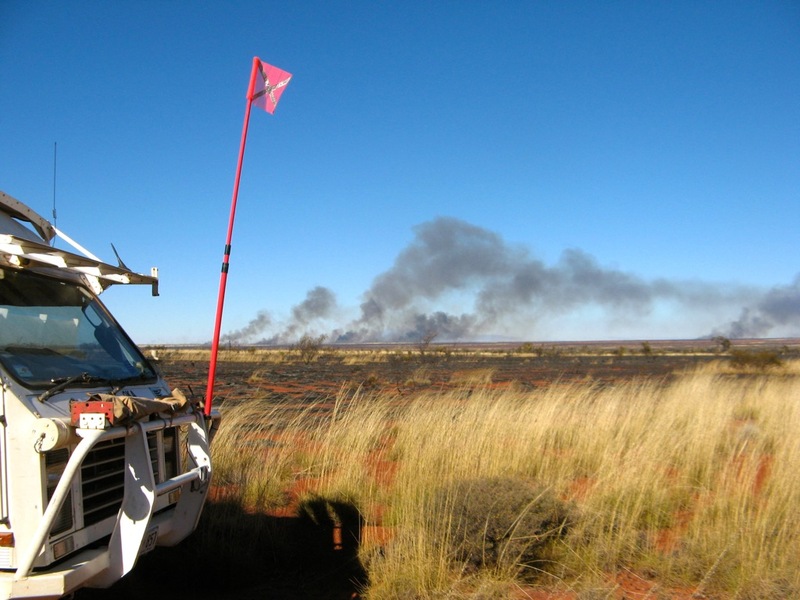 Reached Swindell Field, an abandoned WAPET airstrip and camped at the end of the runway where we had a good view of the fires but where they couldn't creep up on us overnight. 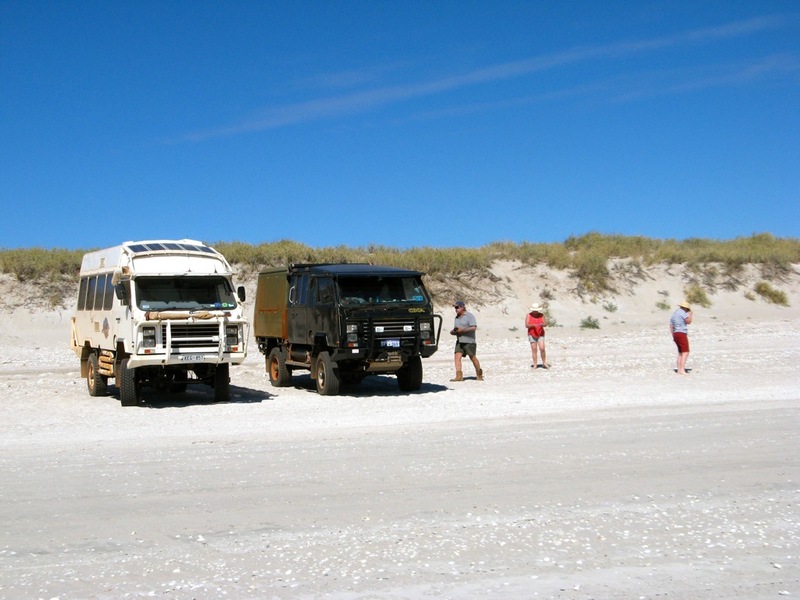 Had a real struggle with a couple of sand dunes which had been capped for trucks in the 1980's but had been badly washed away. 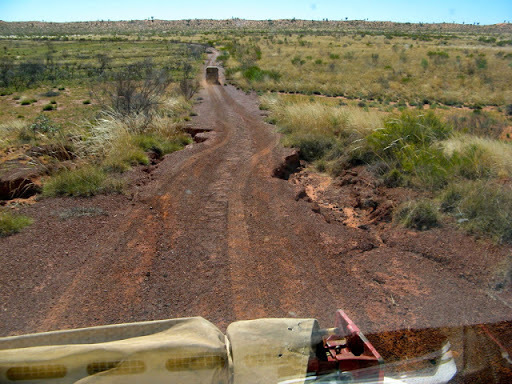 (Dave used to drive road trains over these roads but they've deteriorated somewhat since then). We had to do some extensive gardening before we could make a safe passageway for the wheels to avoid a potential roll over. It took us about an hour to complete the job. Here's a video of our attempt at climbing the washed-away section of the sand dune. It doesn't look so bad in the video because we'd done our homework and planned ahead, but it was also on a steep part of the dune. Negotiating a difficult dune on the Kidson Track after some extensive gardening from David and Janet on Vimeo. 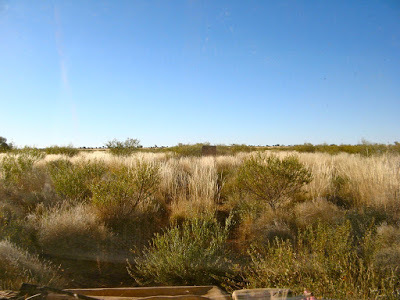 This is the same sand dune from another perspective but low resolution. 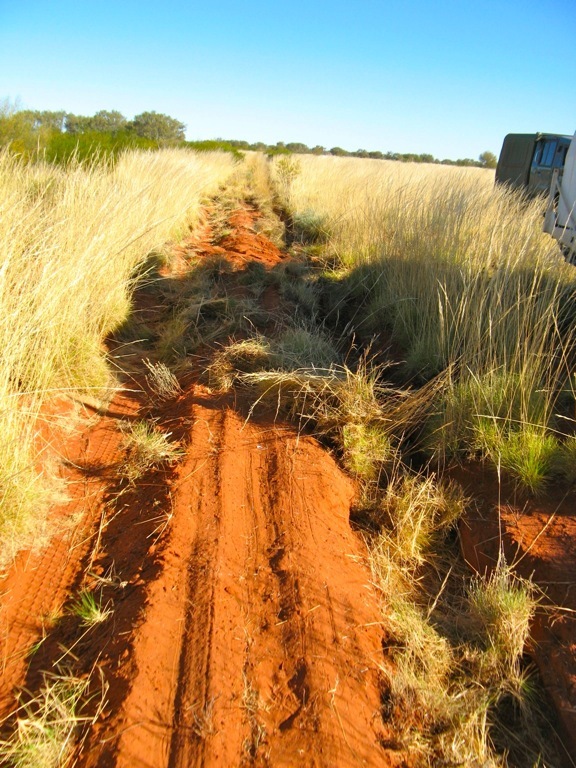 On the other side there were also potentially dangerous weak points along the edges of the track we had to avoid. 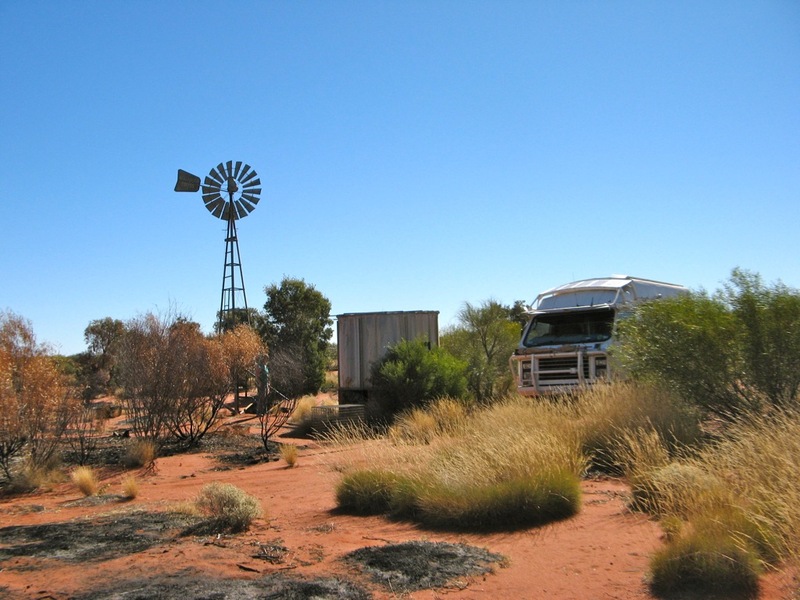 Found and old windmill and tank where we had lunch but there was no water available. However we did find an old tractor with a Perkins engine in it, albeit an earlier vintage than ours. Camped at the foot of a Rocky Outcrop in a very nice sheltered clearing. Did some maintenance on Dave's windscreen wipers which decline to pass 20º without blowing fuses. It took an hour of dismantling but we removed the self-parking mechanism and it all worked again (except of course for the self-parking mechanism). Our apprehension about the track conditions evaporated completely today after the appearance of a grader. We had heard that the track was being graded from the Coastal Highway end but didn't realise it had reached quite so far. According to our sources, the grading will extend 400kms from the highway (including the difficult sand dunes) and then a further 80 km off the track to a mining site. 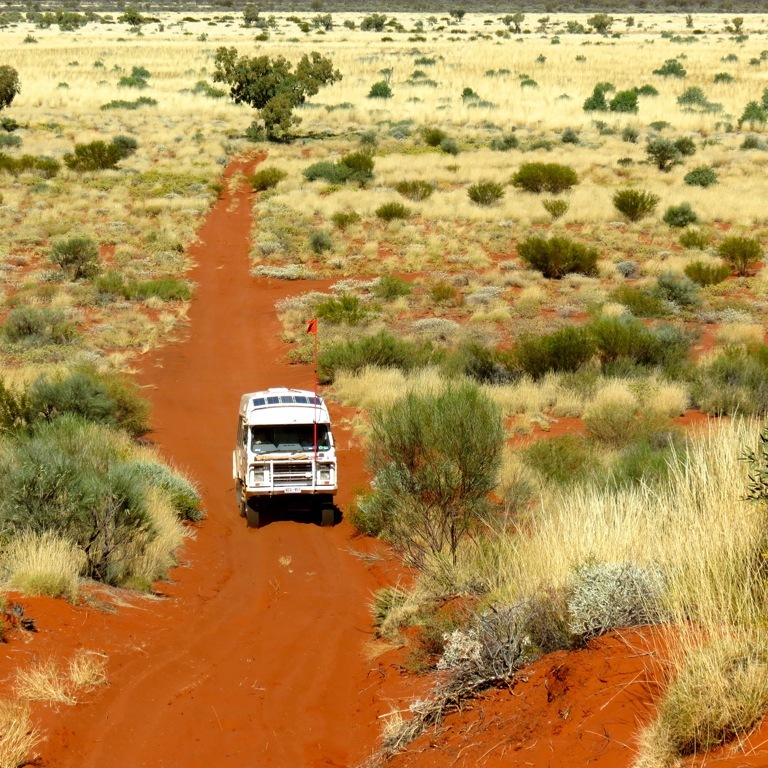 Sadly this will ruin the Kidson Track as an outback adventure for years to come. Only the 100km from Telfer Road junction at Lake Auld to the the start of the sand hills will remain a narrow demanding track. It also appears to now be a Martu Native Title area (hence the earlier "cultural surveys") and restricted access notices are appearing. Dave met an old mate driving a grader that he hadn't seen for 31 years. We stopped in the middle of the track for a chat. We came across 2 huge rolls of steel cable that had fallen off a truck 50 years ago and were too heavy to recover. They are still there and are marked on the map. 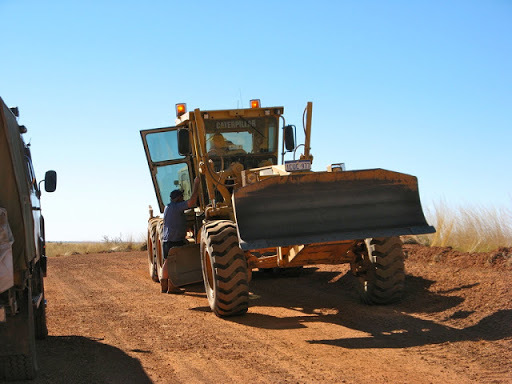 Disparaging remarks by a construction engineer we met about indigenous activities in the area were apparently quite OK because he claimed he was a registered racist. 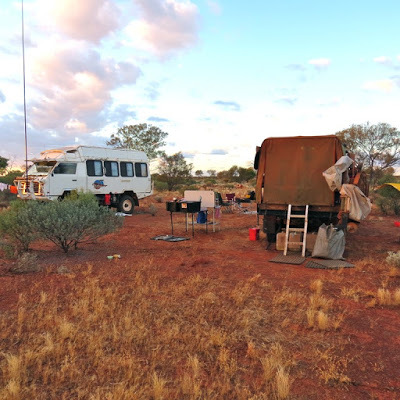 Camped alongside a construction company bore and "turkey nest" (a small dam made from a raised ring of dirt and lined with plastic). This wasn't flat but was the only non-spinifex area in a hundred km. Thousands of budgies came at breakfast time to drink and the noise of their wings while hovering over the water was surprisingly loud. 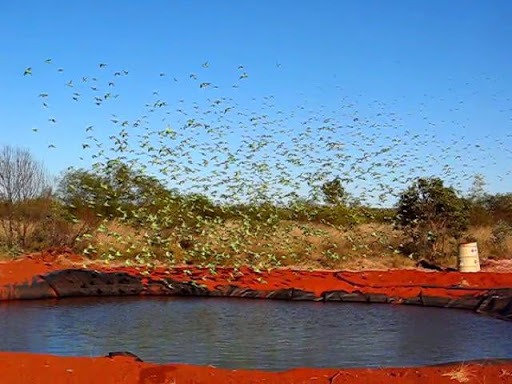 Here's a video of the budgies as their flock increases in size, wheeling and swirling like an immense school of fish, until a hawk appeared and they were gone. 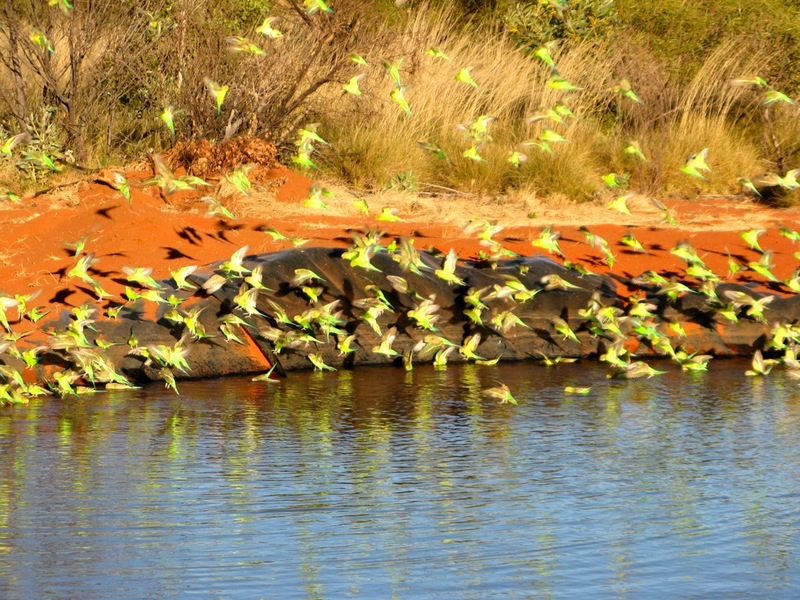 Budgies on the Kidson Track from David and Janet on Vimeo. 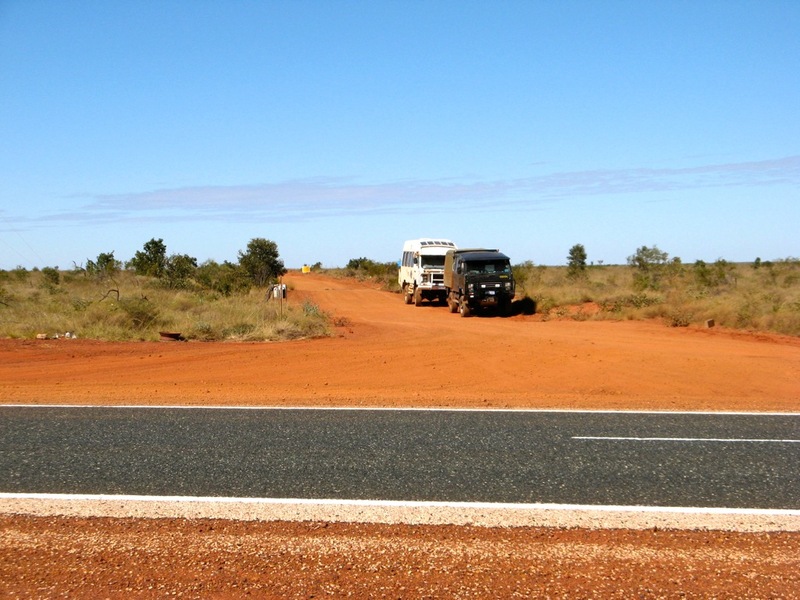 We completed the Kidson Track and met the busy North West Highway, our first bitumen for 2500 km. We drove straight on across the highway and on the 9km into 80 Mile Beach to complete our journey to the sea. After lunch and a frolic on the beach it was white knuckle stuff as we raced down the highway at 60+ kph towards Port Hedland. 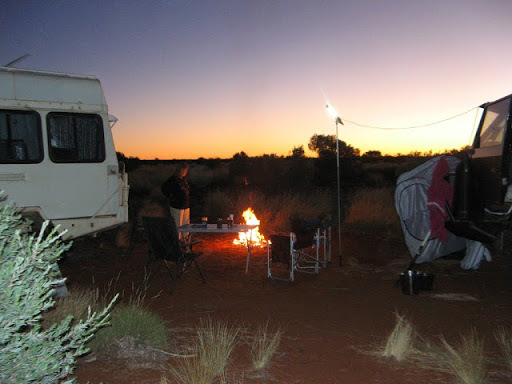 We camped at Pardoo Roadhouse for the night so we can have a final drink and dinner out without the usual campfire, washing up and packing dramas. Real grass to camp on, washing machines and flushing toilets. 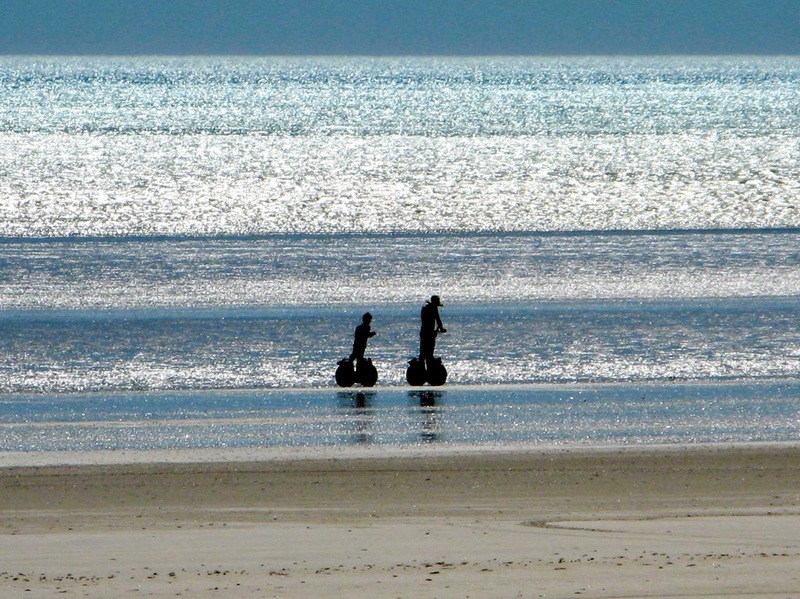 We had forgotten such things existed. "Save a Horse, Ride a Cowboy" was emblazoned in dust on the back of a dirty horse-box. 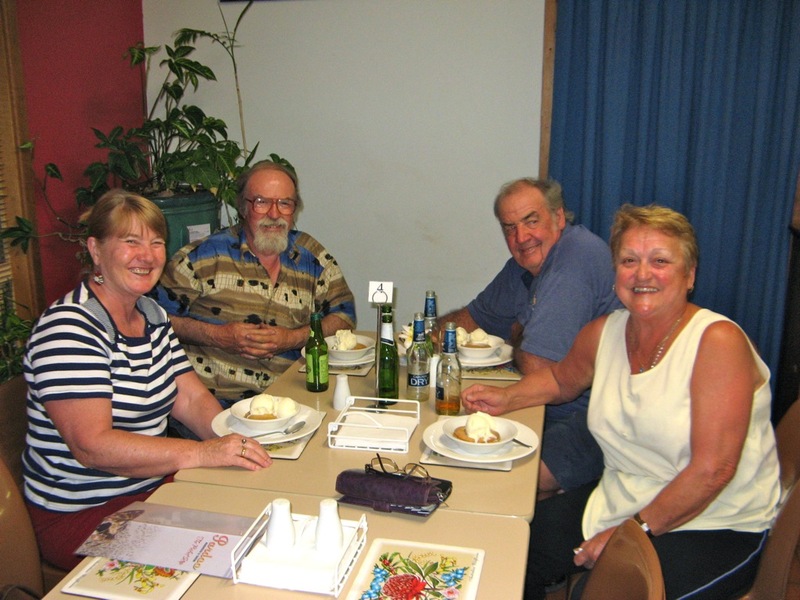 Had fresh fish and chips made from freshly thawed fish, and apple pie with ice cream. No too bad considering our location. Opened and completed emptied a bottle of red wine I had carried from Adelaide and handed back all the things we had borrowed from D and P and vice versa. 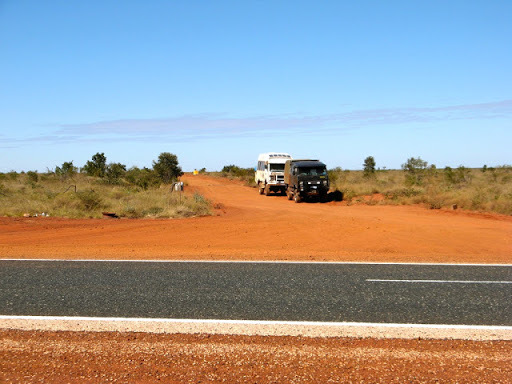 We drove on to Port Hedland, which is never a pretty sight, being a very busy iron ore exporting town, with dusty trucks and mining utes everywhere, and down to the shopping centre at South Hedland. 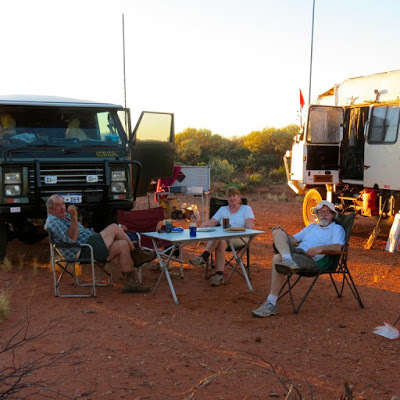 Sadly, we parted company with Dave and Pauline outside South Hedland shopping centre after 3 great weeks of fun and scary bits across 3 deserts and 5 outback tracks. 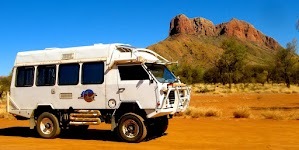 They are heading back to Perth down an inland route and we are heading to Ningaloo for a few days snorkelling and R and R before heading north via an inland route to avoid the caravan crowding and mining activity on the coastal highway. 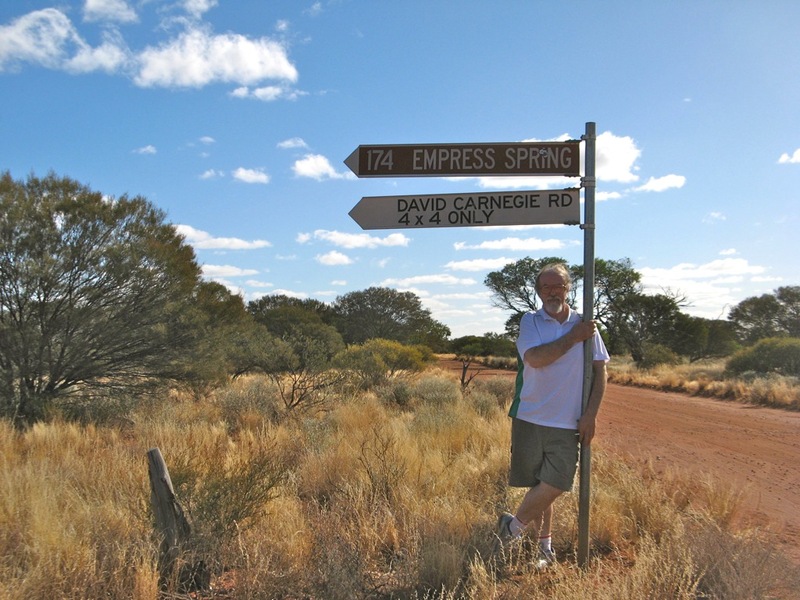 Continue out trek here down the coast via Ningaloo and Waroora Station to Carnarvon.